Private home on 5 fenced acres. 45 minutes to Yosemite. Master bedroom has king size log bed. Second bedroom has 2 twin beds and trundle. Additional small den has a couch. 2 full baths. Large sunny kitchen. Living room has 2 couches, Direct TV, Blu-ray player. Dining area has table seating up to 8. Ceiling fans throughout. Central air and heating plus wood-burning stove. High speed internet. BBQ on porch. Small "zoo" across front fence. Llamas,goats, peacocks, chickens etc. Gas station, store, small restaurant within 1.5 miles. Clean, simple place. Easy-going, yet responsive owner. This place was perfect for the three of us and our two dogs. Nothing fancy, which is just the way we like it. Clean and adequately stocked. Comfortable beds. Thoughtfully decorated. It just has a nice, relaxing vibe. Also, it heated up quickly without us needing to use the wood-burning stove at all. This property was perfect for the three of us. Very clean. I loved the cozy mountain feel of the house. Nothing fancy - which is good! The kitchen was well equipped. Jim was very helpful and very available. I would come here again. In fact, my son is planning to do just that. 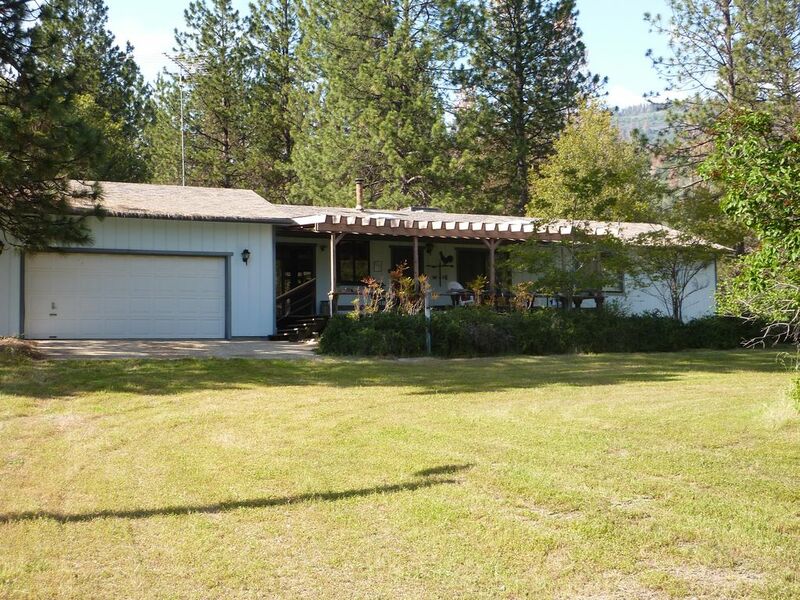 The house is nice and convenient to Yosemite— approximately 1 hour from house to gate. We enjoyed relaxing on the porch and swing out back. An occasional goat would swing by for some entertainment. The owner Jim answered all questions and was accessible when needed. The only (minor) inconvienece is the small coffee pot— wish it was full size. Would stay again. Thank you. Great experience for a family stay! We stayed at Jim’s property for our weekend getaway for Yosemite and it was a great experience. The place is about 45-60 minutes away from Yosemite and the drive is quite scenic. The house is very nice and spacious for a family of 4. It was clean and the smart TV with Netflix was perfect for the kids. As the name says, it is literally at the end of the road, you gotta drive on the dirt road to get to the house. We wouldn’t suggest driving / checking in to the home late night due to the location (dirt road, at the end) and also the cell phone signal is an issue in Yosemite area that we weren’t aware of. Overall, a great experience for our family. Beautiful space -- inside and outside! Toni and LaMar Rogers R.
Great place -- comfortable, clean and convenient. Thanks Jim. Glad we got to meet you. House is located less than 90 minutes from Yosemite and about 20 minutes from Mariposa where we had dinner a couple of times. Though it's out in the country side, there are several interesting animals nearby incuding a peacock and roosters. We enjoyed their calls in the mornings and daytime while at night they were not noisy so we slept well. Comfortable kitchen and dining rooms for meals we ate there. Slept well in the king size bed. Yard is fenced so our dog was safe off-leash outside. It's at the end of a dirt road and we had no trouble finding it. Since it's at the end, the only other vehicles were nearby neighbors so very few vehicles.